Spoil your birds with this intricately designed Bird Cage on Wheels. 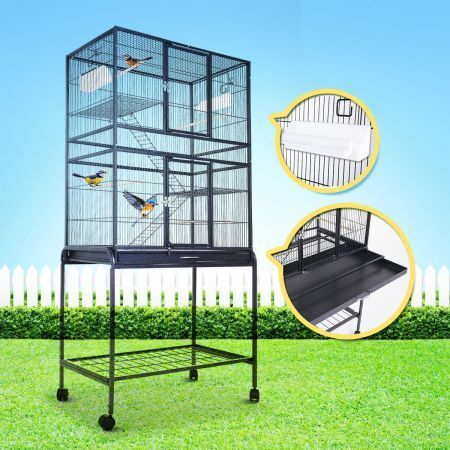 Suitable for small to medium size parrots or birds, this is a beautiful Bird Cage with is equipped with everything a bird would need. Inside, 4 perches are set up with 2 ladders each joined to platforms, connecting into an access way to the top of the cage. Watch your birds balance walk this obstacle and keep them active and healthy whilst safe in the Bird Cage. This Bird Cage is constructed out of wrought iron, this bird cage is sturdy, durable and a pleasure to gaze at. This Bird Cage has 2 plastic water/food bowls, strategically located 1 on each side of the Bird Cage to keep you birds moving. A slide out bottom tray makes it easy to clean the Bird Cage, minimising the burden of looking after birds. 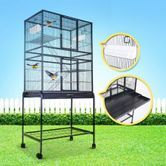 This Bird Cage features 2 large access door that are securly locked and a small central access door, getting to your bird will never be a hassle again. This Wrought Iron Bird Cage also has 4 castor wheels to provide maximum mobility and stability. Your beloved parrot will love its new home and so will you! Not exactly as pictured but still usable.